In all types of engineering of complex systems sophisticated risk assessments are often made within safety engineering and reliability engineering when it concerns threats to life, environment or machine functioning. The nuclear, aerospace, oil, rail and military industries have a long history of dealing with risk assessment. Also, medical, hospital, social service and food industries control risks and perform risk assessments on a continual basis. Methods for assessment of risk may differ between industries and whether it pertains to general financial decisions or environmental, ecological, or public health risk assessment. Risk assessment from a financial point of view. Even though for some risks , we might have , if the probability is small compared to , its estimation might be based only on a smaller number of prior events, and hence, more uncertain. On the other hand, since , must be larger than , so decisions based on this uncertainty would be more consequential, and hence, warrant a different approach. If the risk estimate takes into account information on the number of individuals exposed, it is termed a "population risk" and is in units of expected increased cases per a time period. If the risk estimate does not take into account the number of individuals exposed, it is termed an "individual risk" and is in units of incidence rate per a time period. Population risks are of more use for cost/benefit analysis; individual risks are of more use for evaluating whether risks to individuals are "acceptable". There are many resources that provide health risk information. TOXMAP (maps of the U.S. Environmental Protection Agency Superfund and Toxics Release Inventory data). The United States Environmental Protection Agency provides basic information about environmental risk assessments for the public for a wide variety of possible environmental exposures. The Environmental Protection Agency began actively using risk assessment methods to protect drinking water in the United States after passage of the Safe Drinking Water Act of 1974. The law required the National Academy of Sciences to conduct a study on drinking water issues, and in its report the NAS described some methodologies for doing risk assessments for chemicals that were suspected carcinogens, recommendations that top EPA officials have described as perhaps the study’s most important part. Considering the increase in junk food and toxicity FDA required in 1973 that cancer-causing compounds must not be present in meat at concentrations that would cause a cancer risk greater than 1 in a million over a lifetime. The US Environmental Protection Agency provides extensive information about ecological and environmental risk assessments for the public via its risk assessment portal. The Stockholm Convention on persistent organic pollutants (POPs) supports a qualitative risk framework for public health protection from chemicals that display environmental and biological persistence, bioaccumulation, toxicity (PBT) and long range transport; most global chemicals that meet this criteria have been previously assessed quantitatively by national and international health agencies. Hazard Identification, aims to determine the qualitative nature of the potential adverse consequences of the contaminant (chemical, radiation, noise, etc.) and the strength of the evidence it can have that effect. This is done, for chemical hazards, by drawing from the results of the sciences of toxicology and epidemiology. For other kinds of hazard, engineering or other disciplines are involved. Dose-Response Analysis, is determining the relationship between dose and the type of adverse response and/or probability or the incidence of effect (dose-response assessment). The complexity of this step in many contexts derives mainly from the need to extrapolate results from experimental animals (e.g. mouse, rat) to humans, and/or from high to lower doses, including from high acute occupational levels to low chronic environmental levels. In addition, the differences between individuals due to genetics or other factors mean that the hazard may be higher for particular groups, called susceptible populations. An alternative to dose-response estimation is to determine a concentration unlikely to yield observable effects, that is, a no effect concentration. In developing such a dose, to account for the largely unknown effects of animal to human extrapolations, increased variability in humans, or missing data, a prudent approach is often adopted by including safety or uncertainty factors in the estimate of the "safe" dose, typically a factor of 10 for each unknown step. Exposure Quantification, aims to determine the amount of a contaminant (dose) that individuals and populations will receive, either as a contact level (e.g., concentration in ambient air) or as intake (e.g., daily dose ingested from drinking water). This is done by examining the results of the discipline of exposure assessment. As different location, lifestyles and other factors likely influence the amount of contaminant that is received, a range or distribution of possible values is generated in this step. Particular care is taken to determine the exposure of the susceptible population(s). Finally, the results of the three steps above are then combined to produce an estimate of risk. Because of the different susceptibilities and exposures, this risk will vary within a population. An uncertainty analysis is nearly always included in a health risk assessment. recreational users of a particular product. not to set policies, because the group is too small, or the costs too high. The idea of not increasing lifetime risk by more than one in a million has become commonplace in public health discourse and policy. It is a heuristic measure. It provides a numerical basis for establishing a negligible increase in risk. Environmental decision making allows some discretion for deeming individual risks potentially "acceptable" if less than one in ten thousand chance of increased lifetime risk. Low risk criteria such as these provide some protection for a case where individuals may be exposed to multiple chemicals e.g. pollutants, food additives or other chemicals. In practice, a true zero-risk is possible only with the suppression of the risk-causing activity. Stringent requirements of 1 in a million may not be technologically feasible or may be so prohibitively expensive as to render the risk-causing activity unsustainable, resulting in the optimal degree of intervention being a balance between risks vs. benefit. For example, emissions from hospital incinerators result in a certain number of deaths per year. However, this risk must be balanced against the alternatives. There are public health risks, as well as economic costs, associated with all options. The risk associated with no incineration is potential spread of infectious diseases, or even no hospitals. Further investigation identifies options such as separating noninfectious from infectious wastes, or air pollution controls on a medical incinerator. Intelligent thought about a reasonably full set of options is essential. Thus, it is not unusual for there to be an iterative process between analysis, consideration of options, and follow up analysis. For audits performed by an outside audit firm, risk assessment is a crucial stage before accepting an audit engagement. According to ISA315 Understanding the Entity and its Environment and Assessing the Risks of Material Misstatement, "the auditor should perform risk assessment procedures to obtain an understanding of the entity and its environment, including its internal control. "<evidence relating to the auditor’s risk assessment of a material misstatement in the client’s financial statements. Then, the auditor obtains initial evidence regarding the classes of transactions at the client and the operating effectiveness of the client’s internal controls.In auditing, audit risk is defined as the risk that the auditor will issue a clean unmodified opinion regarding the financial statements, when in fact the financial statements are materially misstated, and therefore do not qualify for a clean unmodified opinion. As a formula, audit risk is the product of two other risks: Risk of Material Misstatement and Detection risk. This formula can be further broken down as follows: inherent risk X control risk X detection risk. In the context of public health, risk assessment is the process of characterizing the nature and likelihood of a harmful effect to individuals or populations from certain human activities. Health risk assessment can be mostly qualitative or can include statistical estimates of probabilities for specific populations. In most countries the use of specific chemicals or the operations of specific facilities (e.g. power plants, manufacturing plants) is not allowed unless it can be shown that they do not increase the risk of death or illness above a specific threshold. For example, the American Food and Drug Administration (FDA) regulates food safety through risk assessment. In project management, risk assessment is an integral part of the risk management plan, studying the probability, the impact, and the effect of every known risk on the project, as well as the corrective action to take should that risk occur. Of special consideration in this area are the relevant codes of practice that are enforced in the specific jurisdiction. Understanding the regime of regulations that risk management must abide by is integral to formulating safe and compliant risk assessment practices. IT risk assessment can be performed by a qualitative or quantitative approach, following different methodologies. One important difference in risk assessments in information security is modifying the threat model to account for the fact that any adversarial system connected to the Internet has access to threaten any other connected system. Risk assessments may therefore need to be modified to account for the threats from all adversaries, instead of just those with reasonable access as is done in other fields. Megaprojects (sometimes also called "major programs") are extremely large-scale investment projects, typically costing more than US$1 billion per project. Megaprojects include bridges, tunnels, highways, railways, airports, seaports, power plants, dams, wastewater projects, coastal flood protection, oil and natural gas extraction projects, public buildings, information technology systems, aerospace projects, and defence systems. Megaprojects have been shown to be particularly risky in terms of finance, safety, and social and environmental impacts. Quantitative risk assessments include a calculation of the single loss expectancy (SLE) of an asset. The single loss expectancy can be defined as the loss of value to asset based on a single security incident. The team then calculates the Annualized Rate of Occurrence (ARO) of the threat to the asset. The ARO is an estimate based on the data of how often a threat would be successful in exploiting a vulnerability. From this information, the Annualized Loss Expectancy (ALE) can be calculated. 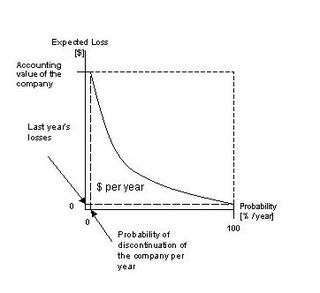 The annualized loss expectancy is a calculation of the single loss expectancy multiplied by the annual rate of occurrence, or how much an organization could estimate to lose from an asset based on the risks, threats, and vulnerabilities. It then becomes possible from a financial perspective to justify expenditures to implement countermeasures to protect the asset. Studies have shown that early parts of the system development cycle such as requirements and design specifications are especially prone to error. This effect is particularly notorious in projects involving multiple stakeholders with different points of view. Evolutionary software processes offer an iterative approach to requirement engineering to alleviate the problems of uncertainty, ambiguity and inconsistency inherent in software developments. Barry Commoner, Brian Wynne and other critics have expressed concerns that risk assessment tends to be overly quantitative and reductive. For example, they argue that risk assessments ignore qualitative differences among risks. Some charge that assessments may drop out important non-quantifiable or inaccessible information, such as variations among the classes of people exposed to hazards, or social amplification. Furthermore, Commoner and O'Brien claim that quantitative approaches divert attention from precautionary or preventative measures. Others, like Nassim Nicholas Taleb consider risk managers little more than "blind users" of statistical tools and methods. In July 2010, shipping companies agreed to use standardized procedures in order to assess risk in key shipboard operations. These procedures were implemented as part of the amended ISM Code. Environmental Risk Assessment (ERA) aim at assessing the effects of stressors, often chemicals, on the local environment. A risk is an integrated assessment of likelihood and severity of an undesired event. In ERA, the undesired event often depends on the chemical of interest and on the risk assessment scenario. This undesired event is usually a detrimental effect on organisms, populations or ecosystems. Current ERAs usually compare an exposure to a no-effect level, such as the Predicted Environmental Concentration/Predicted No-Effect Concentration (PEC/PNEC) ratio in Europe. Although this type of ratio is useful and often used in regulation purposes, it is only an indication of an exceeded threshold. New approaches start to be developped in ERA in order to quantifiy this risk and to communicate effectively on it with both the managers and the general public. ↑ Lacey, Peter (2011). "An Application of Fault Tree Analysis to the Identification and Management of Risks in Government Funded Human Service Delivery" (pdf). Proceedings of the 2nd International Conference on Public Policy and Social Sciences. Retrieved 2013-07-09. ↑ "Risk Assessment and Regulation Information from the NLM". NLM. Retrieved 9 June 2013. ↑ "Databases on toxicology, hazardous chemicals, environmental health, and toxic releases". TOXNET. NLM. May 2012. Retrieved 9 June 2013. ↑ "Household Products Database". U.S. Dept. of Health & Human Services. January 2013. Retrieved 9 June 2013. ↑ "Risk Assessment Portal". EPA. 13 May 2013. Retrieved 9 June 2013. ↑ EPA Alumni Association: Senior EPA officials discuss early implementation of the Safe Drinking Water Act of 1974, Video, Transcript (see pages 11,14). ↑ Szabo DT, Loccisano AE (March 30, 2012). "POPs and Human Health Risk Assessment". Dioxins and Persistent Organic Pollutants. 3rd (Edition): John Wiley & Sons. doi:10.1002/9781118184141.ch19. ↑ Merrill, Richard A. "Food Safety Regulation: Reforming the Delaney Clause" in Annual Review of Public Health, 1997, 18:313-40. This source includes a useful historical survey of prior food safety regulation. ↑ Spring, J.; Kern, S.; Summers, A. (2015-05-01). "Global adversarial capability modeling". 2015 APWG Symposium on Electronic Crime Research (eCrime): 1–21. doi:10.1109/ECRIME.2015.7120797. ↑ Arnold, Rob. "3 Types of Security Assessments". Threat Sketch. Threat Sketch. Retrieved 17 November 2016. ↑ Commoner, Barry. O'Brien, Mary. Shrader-Frechette and Westra 1997. ↑ "ISM CODE – Amendments from 1st July 2010 Risk Assessment". 1 2 Goussen, Benoit; Price, Oliver R.; Rendal, Cecilie; Ashauer, Roman (2016-10-26). "Integrated presentation of ecological risk from multiple stressors". Scientific Reports. 6. doi:10.1038/srep36004. ISSN 2045-2322. PMC 5080554 . PMID 27782171. ↑ Jager, Tjalling; Heugens, Evelyn H. W.; Kooijman, Sebastiaan A. L. M. (2006-04-20). "Making Sense of Ecotoxicological Test Results: Towards Application of Process-based Models". Ecotoxicology. 15 (3): 305–314. doi:10.1007/s10646-006-0060-x. ISSN 0963-9292. Jean-Lou, C. M.; Dorne, George; Kass, E. N.; Bordajandi, Luisa R.; Amzal, Billy; Bertelsen, Ulla; Castoldi, Anna F.; Heppner, Claudia; Eskola, Mari; Fabiansson, Stefan; Ferrari, Pietro; Scaravelli, Elena; Dogliotti, Eugenia; Fuerst, Peter; Boobis, Alan R.; Verger, Philippe (2011). "Chapter 2. 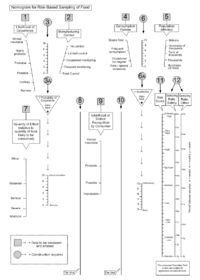 Human Risk Assessment of Heavy Metals: Principles and Applications". In Astrid Sigel; Helmut Sigel; Roland K O Sigel. Metal Ions in Toxicology. RSC Publishing. pp. 27–60. doi:10.1039/9781849732116-00027. Mumtaz, Moiz M.; Hansen, Hugh; Pohl, Hana R. (2011). "Chapter 3. Mixtures and Their Risk Assessment in Toxicology". In Astrid Sigel; Helmut Sigel; Roland K O Sigel. Metal Ions in Toxicology. RSC Publishing. pp. 61–80. doi:10.1039/9781849732116-00061. Kluger, Jeffrey (November 26, 2006), "How Americans Are Living Dangerously", Time, retrieved 27 September 2010 Also published as December 4 cover title: "Why We Worry About the Wrong Things: The Psychology of Risk"